Recommendation: Yes, pick it up for a mystery involving paranormal activities. 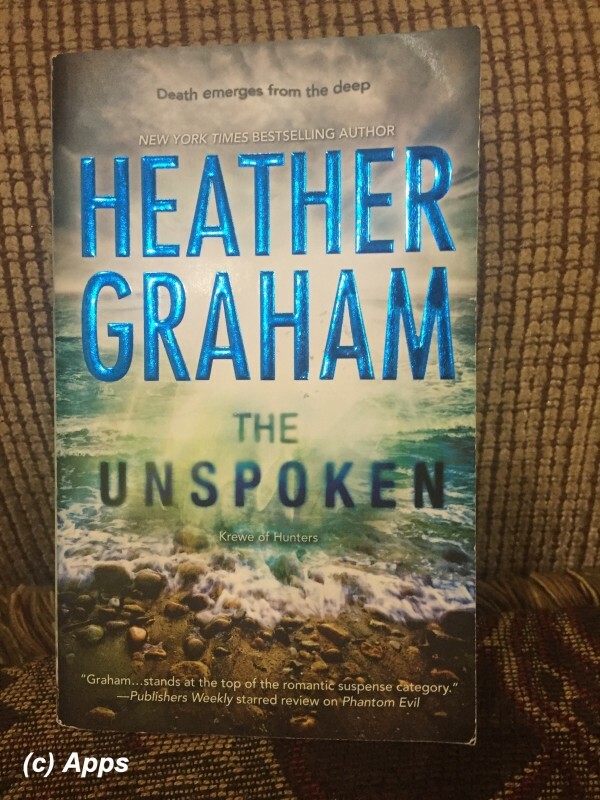 The Unspoken is the seventh book in the Krewe of Hunters series by Heather Graham and published in July of 2012. This plot revolves around Dr. Katya "Kat" Sokolov - the third member from the second group of elite paranormal investigators of The Krewe - and Will Chan - media forensics guru and one of the member of the first Krewe of Hunters. Krewe are a secret FBI unit with each member of the unit honing a particular psychic talent of their own making them the paranormal investigating team. This unit was created to deal with murders having supernatural undertones and paranormal activities. Headed by paranormal investigator Adam Harrison, the elite unit of paranormal investigators is called on to solve cases linked to historical mystery involving legendary crime and serial killings, war events and hauntings. The stories in the book series are located mostly in Virginia and New Orleans, with some well-known legends used as themes. The Krewe are divided in three distinct groups. The first group is led by Jackson Crow called as the original Krewe of Hunters, the second group is led by Texas Ranger Logan Raintree called as the Texas Krewe and the third group is a unit of its own. In the previous book The Unholy (My review of the book here), author Heather ends with Logan Raintree's team being called to Chicago to investigate strange happenings in Lake Michigan aboard shipwrecks that were being documented by a group that they had worked with before in Texas. That is exactly where this book begins. After more than hundred years the doomed freighter Jerry McGuen that went down in Lake Michigan in 1898 finally is found by the Chicago Ancient History Preservation Center. It was common notion that because the ship was carrying the sarcophagus of an Egyptian sorcerer - Amun Mopat - it went down with everyone aboard. Now Brady Laurie - a veteran diver for the Preservation Center - dies while exploring the legendary wreck. Alan King funding the dive brings in the special FBI team headed by Logan Raintree - The Texas Krewe. Logan sends Dr. Katya "Kat" Sokolov - M.E. in their team - to dig deeper into the cause of death of Brady Laurie. She is teamed with Will Chan - media forensics guru and one of the member of the first Krewe of Hunters - in the investigation ahead of her team's arrival. As the investigation proceeds more sinister things start happening seemingly caused by centuries old pharaohs. Or is it? Kat and Will Chan will have to delve into the deep waters of the dark past behind what happened to Amun Mopat long ago, in the near past and now to determine the cause and causer. What more terrible turns does the twisted plot take? How does Kat, Will and the team come out with plausible answers for a crime that looks unexplainable? Heather ties in this plot with the previous book - The Unholy - neatly. Naturally quite a few of the characters from that float into this too including the ill-gotten Amun Mopat and the film Sam Stone and the Curious Case of Egyptian Museum. The romance between Kat and Will is much elaborate than the previous couples in her plot but not too much that it becomes a purely romantic book. Heather still keeps the edge of the thrill But the touch of romance refreshes the plot completely. The plot has a similar tune like her previous books - an incident in the past and something that connects it to the one happening in present and gets investigated by The Krewe. Yet it was a little bit different - may be in the justice that Heather brings to the victims now or the clarity that she gives to things that happened in the past. I liked the continuity that Heather keeps between The Unholy and this plot. All in all another chilling mystery with a touch of romance and of course the otherworldy. Now that we are in the third book for the second team, I am curious to see how the remaining team members stories from both the teams would pan out. a. On Pg. 312 last but one line, it should be "that I need the names…" instead of "what I need the names…". 2. There is again reference to Adam Harrison - who supervises the paranormal investigations for FBI - and how he came upon with these teams. I have the Harrison Investigation Series by Heather Graham that definitely are prequels to this series in my list yet to read. Perhaps after I finish this series. 3. Again this book I have, came with two inserts about free books - you know where the books used to have a hard letter kind of page that you could tear it, fill in some information and mail it with free postage; You would get the free books as promised along with free gifts sometimes. Remember those card inserts? Well, I found them in this book. Why am I surprised because off-late such inserts are no longer seen. I remember seeing them in older books, more like pre-2005 era when internet, online shopping etc wasn’t that hep. But surprised to see it in a book published in 2012. Wonder if the author was trying to revive the good old paper-system of writing letters.